that all children feel toward the natural world. 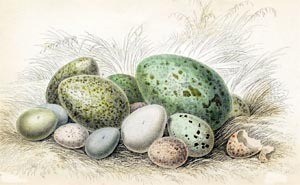 Spring is the season of eggs – bird eggs, frog eggs, turtle eggs, fish eggs! Learn about the animals that laid them and the nests they have built to hold them. Find the hidden “nests” around the Nature Center, then head out on the trails on a scavenger hunt to see where eggs will be laid this spring. Free with admission to the Nature Center. No need to preregister. An early morning walk through Werner’s Woods provides welcome sights and sounds for beginning birders as well as those with more experience in the field. Bird walks are not geared for younger children. Bring binoculars and dress for wet ground underfoot. 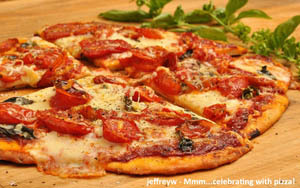 Bring your friends, bring your family for dinner at Flatbread’s at The Shoppes at the Farmington Valley. A percentage of the pizza sales supports the Nature Center. Join us for an afternoon of turtle races celebrating the opening of our new turtle ponds. Will the winner be Toby, the ornate box turtle; Juliette, the box turtle; Timber, the wood turtle; or Sunshine, the Russian tortoise? Turtle crafts. We will be racing our resident turtles. Please leave wild turtles in the wild - do not catch wild turtles for turtle races. Connecticut has a myriad of spring wildflowers. Find out why they bloom in the spring, where to find them, how they got their names and what makes these plants so special. Join us for a special lecture from 1 pm to 2 pm and at 2 pm for a guided walk through our native plant gardens looking for wildflowers. Geared for all ages. Cost: $5 members; $7 nonmembers. Moms admitted free. Learn what you can do to attract bees, butterflies, frogs and other wildlife in your yard. Cost: $5 members; $7 nonmembers. 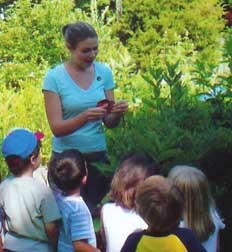 Spend the summer solstice evening at the Nature Center and test your nature trivia knowledge. Pizza slices, sodas, & strawberry shortcake available for purchase. BYOB. 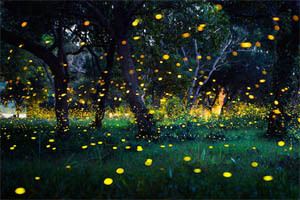 It’s firefly season! Learn more about these fascinating creatures and where to find them. Cost: Admission to the Nature Center (members free). Kick off your 4th of July holiday with our animal demonstration on the many structural adaptations animals have to help them survive. Examine animal skulls & visit with live animals to learn more. This special 45-minute programs feature live and mounted animals and a brief power point presentation. Each program will focus on a different theme, with an up-close opportunity to learn about various animal groups. Cost: $4 children, $6 adults. Pre-registration not required. 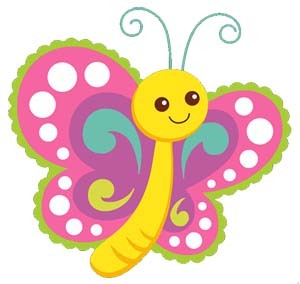 Dress in your butterfly attire and waltz out to the Butterfly Garden for iced tea, lemonade, & cookies! Cost: Admission to the Nature Center (members free)..
Join Nature Center staff to learn about these fascinating creatures. Children must be accompanied by an adult. . The Nature Center will host the Farmington Valley Butterfly Count, a part of an annual survey sponsored by the North American Butterfly Association. To take part in the Butterfly Count meet in the Nature Center parking lot at 7:30 am. Participants in the Count should be prepared to travel throughout the Farmington Valley and be in good physical condition. Not geared for young children. Pre-registration required. No cost to attend Butterfly Count. 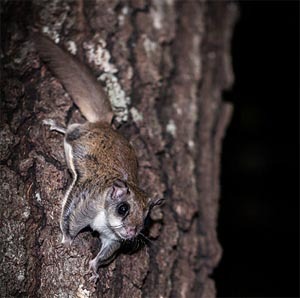 Many animals become more active in the cooler twilight hours. In past years we’ve seen and heard a wide range of creatures on our evening walks. What will we find this summer?! (children: $2 members, $3 nonmembers). 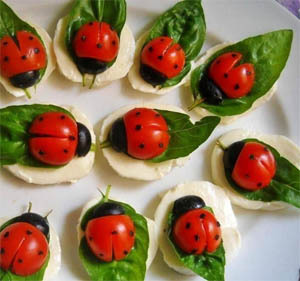 Bring a bag lunch or snack and enjoy an afternoon at the Nature Center learning about ladybugs and other insect helpers. Lady bug crafts & stories, lemonade and cookies. Cost: Admission to the Nature Center (members free). .
Turtles come in many shapes and sizes. Join us as we visit with these ancient animals. Bring your favorite teddy bear & a bagged lunch/snack for a picnic in our butterfly garden — we will supply the lemonade and cookies. Celebrate the end of our summer season with an afternoon at the Nature Center. Learn about our beautiful dragonflies and damsel flies. Hike the trail to the pond to find them. Make a dragonfly craft and visit with “Jewel,” our Dragonfly. What ‘magical’ creatures are living in our woods & gardens? Drop in and, using only natural materials (we will provide some but feel free to bring your own) and your imagination, create your own dwelling for the ‘wee folk’. Brian Kleinman from Riverside Reptiles will present his program on ancient reptiles. Crocodilians and turtles have been around for more than 100 million years, but they have changed little in their appearance. In this program you will learn about how these fascinating reptiles adapted and evolved into the animals we see today. We will learn about their size, power, and hunting strategies, as well as conservation issues that affect their preservation. You will meet a Crocodile and Alligator, along with turtles, tortoises, and an 80 lb. SWAMP MONSTER! 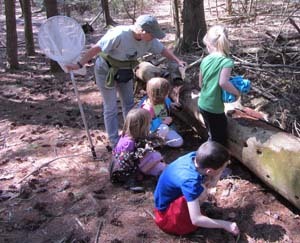 Registration is open for the upcoming Discovery Days, the Nature Center’s enrichment series for children. Four week programs are offered for pre-schoolers and a parent, for students in kindergarten and kindergarten readiness programs and for elemantary age students. For more details, click here. The cost of each four-week session is $40.00 for members, $50.00 for nonmembers. A $10 discount is extended to families with a second child attending during the same time period. Portions of the program are held outdoors, please dress accordingly. Register by mail or in person during regular Nature Center hours. Please call the Nature Center at (860)693-0263 for additional information and to determine if there are class openings prior to mailing your registration. 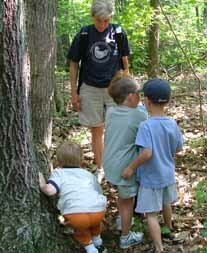 The Nature Center can create special programs for your home school group. Explore the wonders of our woods, fields, and stream. Each class will investigate a different aspect of a central theme, complete with hands-on experiments & plenty of time outdoors. During July and August, group nature walks may be scheduled by individuals, families or by organized groups on selected weekday afternoons. Walks may be general or may focus on a specific topic of interest. Call the Nature Center for additional information. 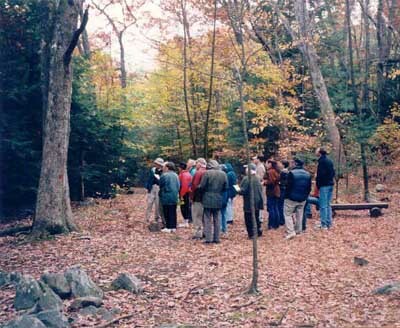 The Werner Woods trails are open year-round for self-guided tours. Trail guide books are available in the Nature Center store for $2.00. Volunteers are needed this summer to help maintain the Porritt Wildflower Trail and the Marabeth Finn Memorial Native Plant Butterfly Garden. Interested in helping out in the garden? Feel free to drop by and help out! Call Margery Winters at the Nature Center to find out more (693-0263). Volunteers interested in working with the Nature Center's Raptor Care Program (must be over 18 years of age), please call the Center (860) 693-0263. Whatever time you can offer will be appreciated. For more information on our volunteer needs, click here. During the school year, the Nature Center offers birthday parties on Saturdays (morning parties from 10:30 AM-12:30 PM, afternoon parties from 1:30-3:30 PM) and on selected weekday afternoons from 3:00 to 5:00 PM. During July and August, the Nature Center will offer birthday parties on selected weekday afternoons from 1:30 – 3:30 PM. (Please note that birthday party availability is subject to the Nature Center’s summer program schedule of classes and public events). Parties include a live animal demonstration, nature walk, and use of our auditorium for holding the party. Cost of a party is $150 for members, $175 for nonmembers. For more information, click here. To make a reservation call the Center at (860) 693-0263. Are you interested in being a part of our Holiday Craft Fair? We welcome vendors who have produced hand-made gifts and/or natural products to sell as 'gifts' during the holiday season. Leaders of Daisy, Brownie, and Junior Girl Scout Troops, as well as Cub Scout Troops, will find that numerous badge requirements may be fulfilled by a visit to Roaring Brook Nature Center. To learn more, click here.